*Updated 7/22/09* Congratulations to the winner Stephanie Reed! She said, "My favorite flavor is Cookies 'n' Cream. Fribbles at Friendly's are so good!" Remember when I wrote about enjoying some free ice cream at Friendly's? Recently, I heard from one of their representatives offering me a $10.00 gift card to try one of their new $9.99 Meals. So today G and I went to Friendly's for lunch. They actually offered more choices than we originally thought. I don't eat beef, so the promotions that I had seen only mentioned the Buffalo Bleu Burger, Cheeseburger Club, and the Apple Walnut Chicken Salad. 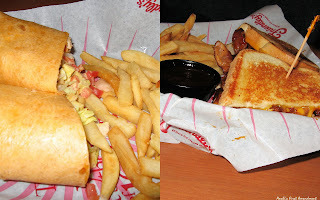 It was a pleasant surprise to see on the menu, that the $9.99 Friendly's Meal has several more options, including the Tuna Salad SuperMelt™ Sandwich, Grilled Chicken Wrap , and Crispy Chicken Salad. The $9.99 Meal includes a drink of your choice, plus you can create your own sundae! Money is tight, so if you're out and about, maybe with some kids (or not) and want to grab a full meal and dessert, Friendly's $9.99 Meal is a good option. So would you like to win a $10.00 Friendly's gift card to try it yourself? I thought you would! July is National Ice Cream Month, so it's the perfect month to think about ice cream. Below, I read this interesting little bit of ice cream trivia. Based on ice cream consumption figures, the top five individual flavors in terms of share of segment in the United States are: vanilla (30%), chocolate (10%), butter pecan (4%), strawberry (3.7%) and chocolate chip mint (3.2%). Quite surprising. Butter pecan? Who would have thought? Today, I had butter crunch ice cream, and G had vanilla and coffee. If you'd like to win the $10.00 Friendly's Gift Card, please leave me a comment below stating your favorite ice cream flavor, real or imagined. There are probably a few fantasy ice cream flavors that haven't made it to the market yet. The contest runs from Monday, July 13th through Monday, July 20th at 5:00 pm Eastern Daylight Time. The winner will be picked at random. You can also follow Friendly's on twitter, become a fan on facebook, and check out some cool Friendly's related pictures on flickr. I need to add some of my pictures on there! If you tweet about this contest, facebook it, blog it, or find a way to flickr it, then come back here and add another comment(s) with the link(s) and you will receive another entry for each of these. Open to US residents only aged 18 years and older. Best of luck to you all! The winner will be announced here by July 24th. *Updated 7/23/09* Thank you again Steve at Iced Media and Friendly's for the Gift Cards! I am an ICE CREAM FANATIC. It's the one indulgence I won't sacrafice. My favorite flavor is what I call a Chocolate Covered Strawberry. It's simple, Strawberry ice cream with Chocolate syrup. Mmmm good! Always a good treat. My favorite flavor is Cookies 'n' Cream. Fribbles at Friendly's are so good! I like vanilla and chocolate - always together, sweet cream and, when I can find a good one, peach icecream. There was an ice cream place in Hanover, New Hampshire that had the best fresh peach ice cream. Growing up in St.Louis, my mother and sister loved Black walnut icecream which they used to get from Velvet Freeze. I don't like nuts in my icecream. I also remember a French Vanilla from an icecream place that was incredibly rich. Glad your tribute to Friendly's got noticed. miss m.d. - That's quite a tasty sounding flavor. Yum! Thanks for the comment. stephanie reed - Welcome! I looove the Fribbles! They take me back to my childhood! can-can - All this "talk" of ice cream makes me realize that I haven't made any this summer. I have to put my ice cream maker in the freezer and get to it. As always, I really appreciate your comments! I'll check out those recipes soon. Thanks for the tip!